On Monday, 4 September, after eating breakfast at our hotel, we walked to the subway station. After buying tickets, we discovered that we had left our best Athens map at the hotel. Though we asked directions and found a subway map on the wall at the train platform, we could not figure out how to get to the Ancient Agora near the Acropolis. We returned to our hotel room to retrieve our map, then took a taxi to the Agora. Actually, he dropped us off near the Agora. We never did find an entrance gate for the ruins. Finding many interesting shops in the area, we shopped till lunch time. We had a nice lunch at a sidewalk cafe beside the Agora. We bought so much stuff that after lunch we walked several blocks back to our hotel to unload our bags and boxes. Then we were off again to the Plaka, the tourists' favorite shopping district in Athens. Here Jeannie searched for a big Greek vase. The one we bought was too big for our suitcases. When finally finished about 5:30, around an hour after we started the shipping fiasco, we tried to get a cab to the Acropolis, known the world over as the landmark of Athens. It took us until 5:50 to find an empty taxi. The driver wasn't sure he should take us there since the ruins would close soon. 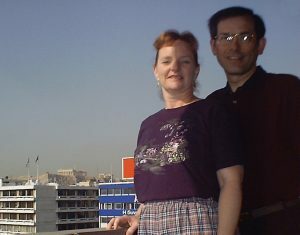 We bought our tickets about 6 o'clock and climbed the steps to the top of the Acropolis. The angle of the sun was perfect for getting some great photos of the Parthenon, also known as the temple of Athena. We rushed through the museum, then spotted our hotel in the city below. After the archeological site closed at 6:30, we walked to the Plaka to do some more shopping. We stopped at a sidewalk cafe long enough to eat supper, which ended up being very similar to lunch. It was really good food, but it was sad to know that it would be our last meal in Greece. We lost count of how many Greek salads we ate during this trip. After supper we shopped as we walked back to our hotel. We ate gelati before we got out of the Plaka. Then we went to our hotel room to pack for the trip home and finally rest our aching feet. The few drachma we had not spent were left in our hotel room for the maid.